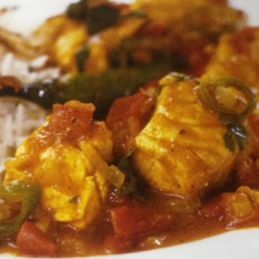 Creole fish recipes are simple to cook - once you've got the ingredients together, you just stir it a couple of times and it's ready in less than 20 minutes. This particular recipe is one that I've cooked many times - you can mix the fish if you like to give a variety - whatever's best on the day I always say. The only fiddle about this recipe, is that you need to rinse the rice several times to get rid of most of the starch as it is served in its cooking liquid. Put the rice in a sieve and run water through it until it is no longer cloudy - stir it round with your fingers. This is a useful tip for any rice dish actually - even when you're boiling it plain to serve with something - it lets the grains separate properly. Heat the olive oil in a large casserole dish that you can use on the stove top. Gently fry the onion and pepper until softened. Add the rice and stir round until coated with oil - do this off the heat as you can easily burn uncooked rice at this stage. Add the tomatoes, puree, basil and chilli powder. Cover the pot and simmer for about 10 minutes. Give it all a good stir and then add the fish and prawns. Cover and cook a further 10 minutes or so until the cod flakes and the rice is soft. Serve hot - sprinkle with some chopped herbs if you like. 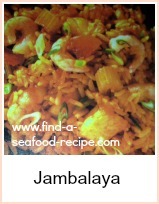 Other popular creole fish recipes are jamabalaya and gumbo - there's recipes for those on this site too. 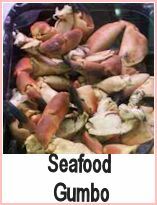 A one pot seafood creole recipe that is super quick to prepare and cook. 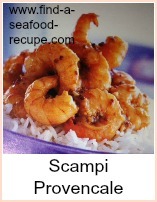 This will be a great family favorite, one that you can adapt for any mixture of seafood you have.